"There are no prizes for recognising the names of the authors of this new volume, as this is the eagerly-awaited 'landscape' format colour album featuring photographs of Stanier 8Fs during their working lives which has been written for and on behalf of the Society by three members of the Board. The many long hours of research, making the choice of photographs and painstaking attention to detail by Jeff, David and George shines throughout this book, which not only provides enjoyable reading but which will serve as an important work of reference for the future. Concentrating mainly, but not exclusively, on freight workings the picture captions are bristling with information and regularly provide a level of informed comment which sets this work apart from others in this genre of photographic album. 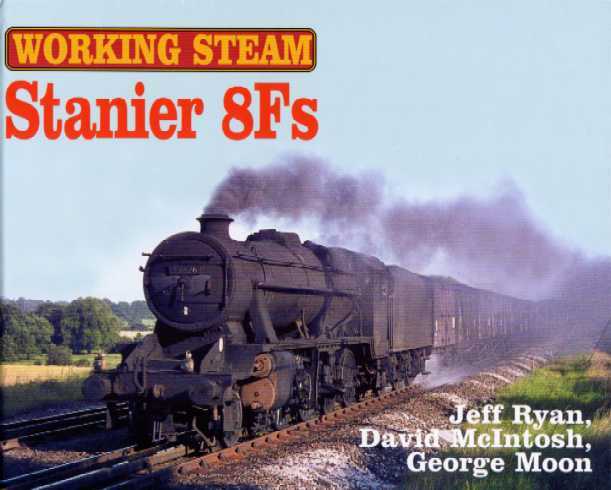 All three authors may be considered an authority in their chosen areas and the result is a highly entertaining and deeply informative consideration of the duties of the Stanier 8F class through the different areas of the UK (and beyond) where they found revenue-earning employment. Having been present at some of the selection meetings where slides were considered for inclusion, your reviewer can vouch for the painstaking deliberations which took place, and also the extensive discussion concerning possible captions. Many excellent and worthy photographs were rejected because either there was no room for inclusion or the subject matter was not considered to be sufficiently interesting. The result is a stunning photographic record and the authors are to be congratulated on a job very well done. The book leaves the reader eager to buy volume 2 ! Early indications are that the book is proving to be a good seller, with some excellent reviews and letters of congratulation being received on behalf of the authors by the Society." The all colour album contains 88 photographs being the work of 38 photographers. The authors have stuck closely to the title of the book, meaning that only three shed scenes (Northwich, Royston and Willesden) are included. The sheer number of quality transparencies exceeded all expectations and there is sufficient material to fill another 2 volumes. With colour transparency film not in wide use prior to the 1960's there is inevitably a concentration of scenes from the North West. However, the album has been divided into sections, the other areas being Scotland, Yorkshire, The Peak District, West Midlands, East Midlands, South East, Wales and The Marches, The West Country and Overseas. Many of the captions are in excess of 100 words and, wherever possible, additional background material has been provided. Please send your remittance payable to the Society with your order. The cost is £14.99 including postage and package. If you would like a copy signed by the 3 authors, please indicate. Listed below are the locomotives, locations, photographers, workings and the builders who are featured. The vast majority of photos are taken between the late 1950's and August 1968, whilst those taken in Iraq and Turkey follow a little later. The earliest shot is black and white but has been hand tinted by the photographer and dates from 1939. Of the above, 7 locomotives appear twice whilst 48062 and 48729 share top billing with 3 appearances each. Alloway Junction, Ashwood Dale, Aylesbury, Bamber Bridge, Bath, Beattock, Birkenhead, Birmingham New Street and Snow Hill, Blackburn, Blackwell, Bourne End, Brock Troughs, Builth Road, Bury, Bushey Troughs, Cardiff, Carlisle (Kingmoor), Near Chapel-en-le-Frith, Cheadle, Chester, Near Chinley, Copy Pit, Craven Arms, Near Crewe, Dent, Dove Holes Tunnel, Driffield, Edale, Entwistle Viaduct, Farington Curve Junction, Glendon South Junction, Gowhole, Great Barr, Great Rocks Junction, Hatton Bank, Heap Bridge, Heaton Mersey, Hooton, Kirkham and Wesham, Lansdown Junction, Larbert, Leeds, Longwood, Lune Gorge, Lyncombe Vale, Mallerstang Common, Manchester Exchange and Victoria, Midford, Mirfield, Moore (Cheshire), Mirfield, New Basford, Northwich, Nottingham Victoria, Nuneaton, Peak Forest, Poulton, Preston, Near Ribblehead, Rochdale, Rose Grove, Rowington Troughs, Royston, Saltley, Scout Green, Stafford, Staley an Millbrook, Tring, Twyford, Tyseley, Water Orton, Wellingborough, Wigston, Wild Boar Fell, Willesden, Woodley Junction, Mosul (Iraq), Irmak (Turkey) and Zile (Turkey). Peter Alexander, Hugh Ballantyne, Don Beecroft, Tony Bowles, Mike Chapman, Frank Cronin, Derek Cross, John Edgington, Ken Fairey, Ken Falconer, Peter Fitton, Bill Gates, Richard S Greenwood, Roy Hobbs, Bert Holland, Ken Horan, Geoff Hunt, Derek Huntriss, Alan Jarvis, Michael Mensing, Gavin Morrison, Les Nixon, Vic Nutton, Trevor Owen, Derek Penney, Bill Potter, Keith Preston, Edgar Richards, Paul Riley, Geoff Rixon, Basil Roberts, Gerald T Robinson, Don Rowland, Eric Russell, Neville Simms, George Staddon, Tommy Tomalin and Michael Welch. Mixed freights of all descriptions. Conveyance of anhydrite, ballast, breakdown crane, bricks, cattle, coal, coke, containers, engineers spoil, gunpowder, gypsum, limestone, newspapers, oil, parcels, soda ash, track panels, weedkiller and a failed dmu! Some of the workings are of course return empties. Passenger workings - ecs, enthusiasts railtour, local on final day of Somerset and Dorset, seaside excursion. Agecroft, Bath (Green Park), Bescot, Bletchley, Bolton, Burton, Buxton, Carlisle (Kingmoor), Coalville, Crewe South, Cricklewood, Edge Hill(Liverpool), Gloucester, Heaton Mersey, Kettering, Kirkby, Leeds (Holbeck), Leicester, Lostock Hall, Mold Junction, Newton Heath, Northwich, Nottingham, Nuneaton, Patricroft, Polmadie (Glasgow), Rose Grove, Royston, Rugby, Saltley, Shrewsbury, Stafford, Stockport (Edgeley), Stoke, Stourton, Tyseley, Wellingborough, Westhouses, Willesden and Woodford Halse.